justin, our web geek, has been working with Peter and Virginia for over a decade (before he joined the Brainspiral team). A few years ago their side business, BackRoads Granola became their main business and they were in need of a new site to showcase and sell their award winning granola. Brainspiral was happy to work with them to meet their needs. 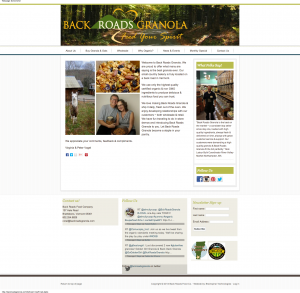 Back Roads Granola includes e-commerce, twitter feeds, a blog that pushes content to facebook and much more. Click Here to Download our Teamviewer QuickSupport app!